Discover a new way to manage your website, business and blog. Now it’s easy to manage your website, business and blog on the go with the Wix app. With live chat, a dedicated message center for all your site-related messages and easy photo upload, the Wix app gives you the tools to always stay connected to your Wix site and customers. Simply log in to your Wix account to start managing your business and website on the go. Busy? Work in sync with your team and instantly see when a co-worker responds to a message. Receive instant updates when someone sends you a message, buys a product or makes a reservation. Want to add photos to your site, store or blog from your phone? Simply take a picture and upload in the app - it’ll be instantly available to use anywhere in your Wix site. 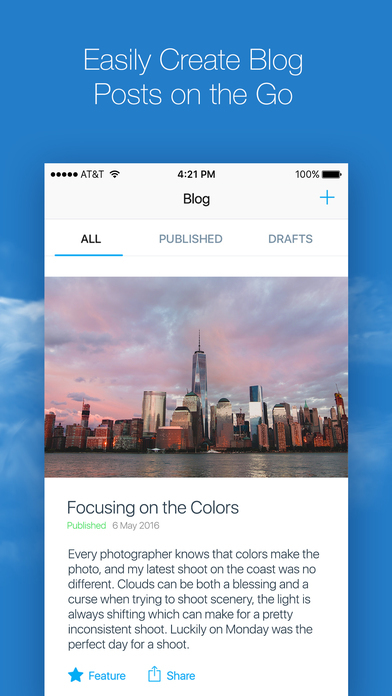 Add new blog posts right from the app. Simply add text, snap a photo and hit publish. It’s that easy. * Run your store from anywhere - Track your orders, add new products, create discounts and get notifications when you’ve made a sale. * Blog on the go - Add blog posts on the go. Write text, snap a photo and hit publish. It’s that easy. * Manage Bookings - Run your hotel from anywhere. See new reservations, create rates, block days and more. * Know what’s happening on your site right from your phone - instantly know when a customer buys a product, gets in touch, subscribes to your mailing list and more. * Chat live with your visitors - get a push notification each time a new visitor arrives on your site, see which page they’re viewing, and reach out to them with live chat. * Never miss a lead - use the app to immediately respond to messages from customers & leads. Everything is arranged by contact, so you can view your entire history with your clients - like messages, orders and more - all in one place. * See it, snap it, add it - upload photos from your phone to use on your site, store, or blog. * Teamwork made easier - instantly sync with your team. If they reply to a message, you’ll see it on the app. We’re constantly working to improve the app and give you the best mobile experience possible.